After World War II, Lubica Brugger with her family came to the United States. They settled in Wisconsin. She married, had two children and worked as a casualty underwriter. At 33 she added to her schedule evening courses at UWM. Six years later, she graduated with honors obtaining a degree in Education. She taught French and German in High School. She always told stories to her children and grandchildren who asked her to write them down for them. This book is a collection of some of those stories. 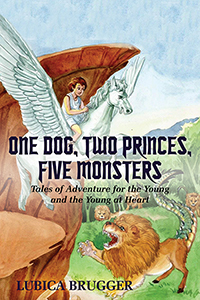 In this book, you will meet one mischievous dog named Yoshie, you will also meet adventurous twin brothers, Prince Nick and Prince Alex, and five horrible monsters bravely faced by a young Greek boy whose name is Oreos. Yoshie loves to visit her friends and go on adventures. She helps find a lost toddler, catches a burglar, and her bark chases away the school bullies. Oreos with the help of a beautiful white horse named Pegasus, meets and defeats evil monsters from the Greek myths, even though Oreos is very afraid, he is determined to overcome all obstacles. Prince Nick and Prince Alex travel throughout their father’s kingdom righting wrongs, riding horses, getting in and out of trouble and solving problems… I hope you enjoy these stories!